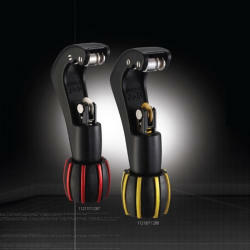 *All New Patented Smart Spring Tube Cutter will enable cutters to cut tubes automatically. *The Cutter will adjust its position of the blades to cut not perfectly round-tubes effortlessly. *The Spring Design prevents the crush of soft tubes. *Thinner and sharper blades enable to cut tubes efficiently. *Snap-on pins enable the blades changing easily.